At first glance, it looks like a single-box system. But it's actually a separate sound bar and subwoofer that can sit together on a stand. 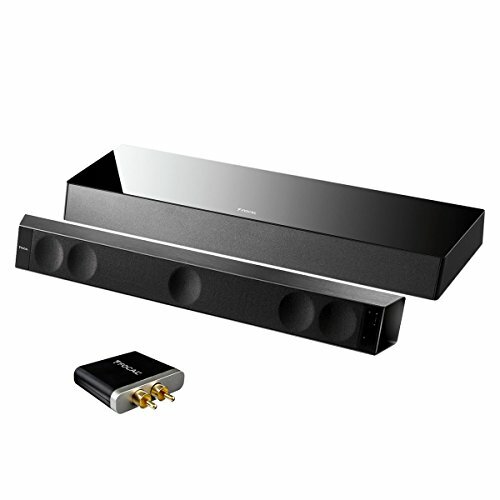 The sound bar offers true five-channel sound that's both detailed and immersive. The subwoofer can support a large LCD or plasma TV while delivering deep bass response to give movies and music more impact. The Dimension sound bar's five built-in speakers were inspired by Focal's high-performance car speakers (which we love, by the way). They designed a speaker that was relatively flat with deep bass response and a wide dispersion pattern. The drivers were further refined and augmented with side-panel ports for enhanced bass response. The Dimension subwoofer is a little different from the typical sub that's included with a sound bar. First of all, it's powered by the sound bar's extra sixth channel of amplification. Secondly, it's designed to sit directly behind the sound bar, so you don't have to put it next to your couch or elsewhere in your room. Third, this subwoofer's rigid cabinet can support a large TV - including some with screen sizes up to 70 inches - making it easy to find room for it on your TV stand. The cabinet is also vibration-resistant, so your TV doesn't shake and shimmy while this sub pushes out seriously deep bass from its two oval-shaped drivers and side-panel ports. There's a cool touchscreen front-panel display for volume and source control. It only lights up when it senses hand-motion in front of it or a command from the remote control. HDMI connectivity offers Dolby and DTS processing, for true 5.1-channel home theater sound. HDMI also lets you control the system and your TV with a single remote. It can also receive audio coming from your compatible TV's tuner with the Audio Return Channel (ARC) feature.More freedom for your mobile devices without impairing audio reproduction quality. The apt-X codec achieves a 4:1 compression ratio, allowing for near-CD quality listening.